Energy efficiency improvements in the building sector can yield significant financial and environmental benefits including reduced energy costs, decreased greenhouse gas emissions, improved occupant health and increased local employment. However, long standing market and policy barriers stand in the way of achieving these potential benefits at scale. Latin America, facing increasing populations in urban cities, could reduce global energy demand by one-third if available energy efficiency best practices were implemented widely. A number of recent initiatives are helping to accelerate energy efficiency programs in in Latin American cities. The UN Sustainable Energy for All (SE4ALL) Building Efficiency Accelerator is an international, multi-stakeholder network devoted to helping cities and sub-national governments speed up the adoption of best-practice building efficiency policies and double their rate of energy efficiency improvement. The network also includes a number of corporate and NGO partners that cover a range of technical competencies across the building design, construction, operations and retrofit life cycle. The World Resources Institute (WRI) Building Efficiency Initiative serves as the managing partner for the Building Efficiency Accelerator and leads a broad coalition of partners including ICLEI, the World Green Building Council, WBCSD and others in coordinating engagements in Latin America and around the world. 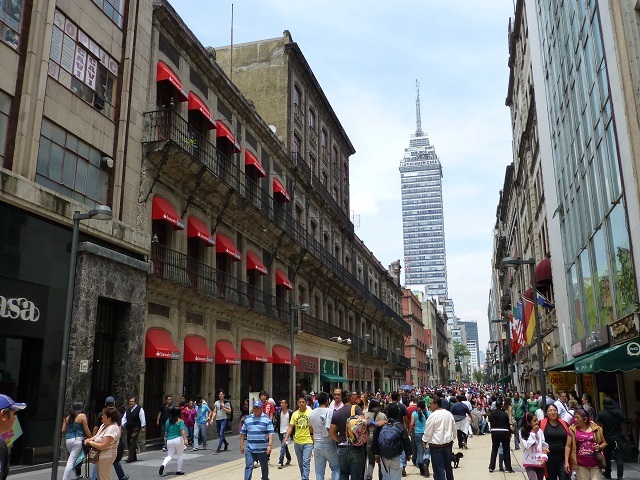 At the 2014 Climate Summit, Mexico City announced a commitment to the SE4ALL Building Efficiency Accelerator with goals to adopt a local energy code and undertake a retrofit of public buildings. The WRI Building Efficiency Initiative and WRI’s Mexico affiliate CTS EMBARQ are leading the Mexico City engagement. In March 2015, a multi-stakeholder workshop was convened where over 100 participants from local technical organizations, businesses and federal ministries met with the city, SE4All leaders and international delegates. In April, the partners formed four working groups co-chaired by Mexico City and a local partner. These groups meet every few weeks and conduct technical workshops to complete the recommendations which will be presented to the Mexico City government in September 2015. In June, the Global Green Growth Forum held their Latin American and Caribbean meeting in Santiago, Chile where building efficiency policy challenges and market solutions were discussed during a session on the SE4ALL Building Efficiency Accelerator. Christina Gamboa, Executive Director and CEO of the Colombia Green Building Council described the implementation challenges facing the region and the opportunity to promote building efficiency solutions that are attractive to both business and governments. Manuel Olivera, C40 regional director, then described the work they are doing with 11 cities in Latin America to improve public buildings, private buildings and transportation systems. The session included participants from the public-sector, private-sector and civil society who collaborated to prioritize a number of building efficiency policies based on importance and difficulty of implementation. Building efficiency financing was considered very important, but relatively difficult to implement, while building energy codes and building certifications were nearly as important but easier to implement. A major recommendation coming out of the session was to focus on intermediate sized cities in Latin America with populations from 500,000 to 2 million. These cities often have committed leadership, less bureaucracy, limited capacity and receive less support from international organizations. On September 9-10, the Colombia Green Building Council will host CONSTRUVERDE in Bogota where a similar session will be held to explore opportunities for the SE4ALL Building Efficiency Accelerator to engage with additional cities in Colombia and Latin America. For additional information on the SE4ALL Building Efficiency Accelerator, please join us in Bogota at CONSTRUVERDE, register for an upcoming WRI/ICLEI webinar on September 1, or view a previously recorded webinar. This article was originally published on usgbc.org.